Antigen and antibody are two interconnected terms used in immunology. The main difference between antigen and antibody is that an antigen is a substance that can trigger an immune response in the body whereas n antibody is the globin protein produced in response to a specific antigen. In order to elicit an immune response, an antigen should bind to an antibody or T-cell receptor. Immunogen is another term for antigen. An antibody is also called an immunoglobulin (Ig). An antibody is composed of two heavy chains and two light chains of proteins, giving a Y-shape to the entire molecule. Antibodies are produced by the plasma cells in the blood and they are highly specific to a particular antigen. An antigen is any substance that triggers an immune response in the body. Antigens are also called immunogens. Antigenic determinants are present on the surface of the antigen and these antigenic determinants fit with the receptor molecules with a complementary structure. These receptor molecules are present on the T and B lymphocytes in the blood. The binding of the antigenic determinant to the corresponding receptor on the lymphocyte stimulate the proliferation of that particular lymphocyte type bearing the complementary receptor. The proliferation of the lymphocyte initiates the immune response and produces specific antibodies to that particular antigen determinant. It also activates cytotoxic T cells. Different types of antigens bind to the different receptors of the lymphocytes as shown in figure 1. Antigens can be divided into various types based on their origin. Exogenous antigens are the substances that enter the body from the external environment. Pathogens such as bacteria, virus, fungi, and parasites are examples of exogenous antigens. In addition, snake venom, toxins, red blood cell antigens, and antigens in the serum are also exogenous antigens. The entrance of exogenous antigens can occur through ingestion, respiration, injections or through wounds. Endogenous antigens are the metabolic products of the microorganisms living in the body. Autoantigens are the components of the body that are recognized as antigens by the immune system. The recognition of autoantigens causes autoimmune diseases. Neoantigens are the T-cell antigens present on the surface of cells infected by oncogenic viruses. An antibody is a glycoprotein produced in the blood by plasma cells in response to a particular antigen. Antibodies are also called immunoglobulins (Ig). An antibody is made up of four peptide chains, two heavy chains and two light chains. The complete molecule is Y-shaped. The antigen binding sites are present at the each end of the two light chains. It is a variable region of amino acids, which gives specificity to the antigen binding. The size of the antigen binding site is 110-130 amino acids. Five types of antigens can be identifies based on the structure and the function of the constant region. They are IgM, IgG, IgE, IgD, and IgA. 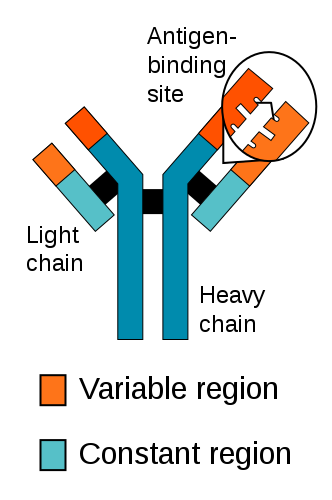 The structure of an antibody is shown in figure 2. Antibodies can be found in both blood circulation and the lymphatic system. The attachment of antibodies to their specific antigens neutralizes the antigen and triggers an immune response. This binding can immobilize pathogens from the circulation. It also induces the complement reactions, which lyse the pathogen. The complement reactions can attract the phagocytes as well. Both antigen and antibody are involved in triggering an immune response. Both antigens and antibodies are involved in destroying the foreign substances. Antigen: An antigen is any substance that triggers an immune response in the body. Antibody: An antibody is a blood protein that is produced against a specific antigen. Antigen: Antigens are also called immunogens. Antibody: Antibodies are also called immunoglobulins. Antigen: Antigen is the foreign substance that triggers an immune response. Antibody: Antibody is the glycoprotein produced in response to the antigen. Antigen: Antigens can be either proteins, carbohydrates, lipids or nucleic acids. Antigen: The interacting domain of the antigen with the antibody is called the epitope. Antibody: The variable site of the antibody can bind to the epitope. Antigen: Antigens cause either diseases or allergic reactions. Antibody: Antibodies protect the body from antigens either by immobilizing the antigen or lysing the pathogen. Antigen: The four types of antigens are exogenous antigens, endogenous antigens, autoantigens, and neoantigens. Antibody: The four types of antibodies are IgM, IgG, IgE, IgD, and IgA. 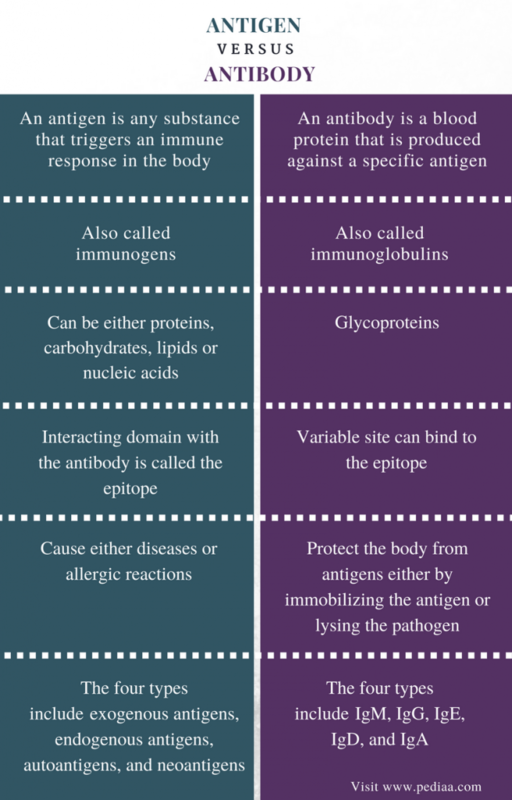 Both antigens and antibodies are molecules that are interconnected with the immunological reactions in the body. An antigen is a substance that can trigger an immune response in the body. An antibody is the globin protein produced in response to a specific antigen. The main difference between antigen and antibody is the role of each substance in the immune system. 1.“ Antigen.” Encyclopædia Britannica, Encyclopædia Britannica, inc., Available here. Accessed 30 Aug. 2017. 2.“Antibody Structure.” THE BIOLOGY PROJECT – IMMUNOLOGY, Available here. Accessed 30 Aug. 2017.